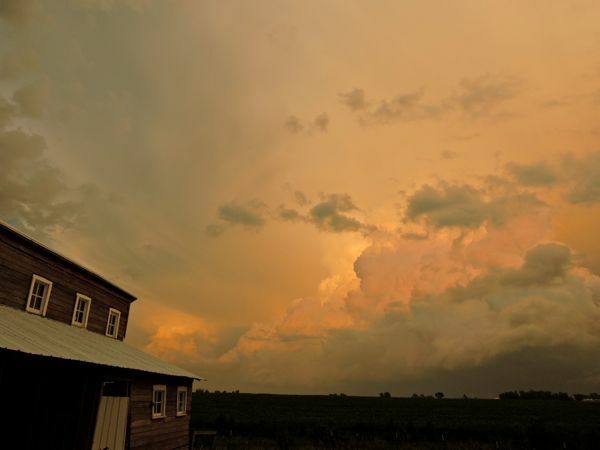 July 6, 2014 – Mother Nature’s Fireworks and Funnels, Oh My! Once again, dramatic skies in the neighborhood. 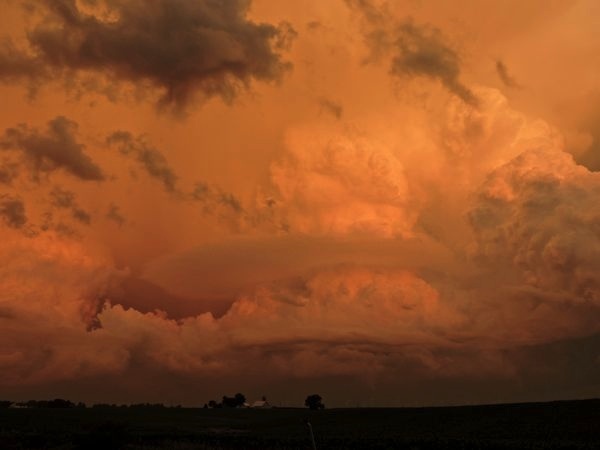 Looking to the tornado-spawning clouds to the south before sunset. Same place as the sun set. 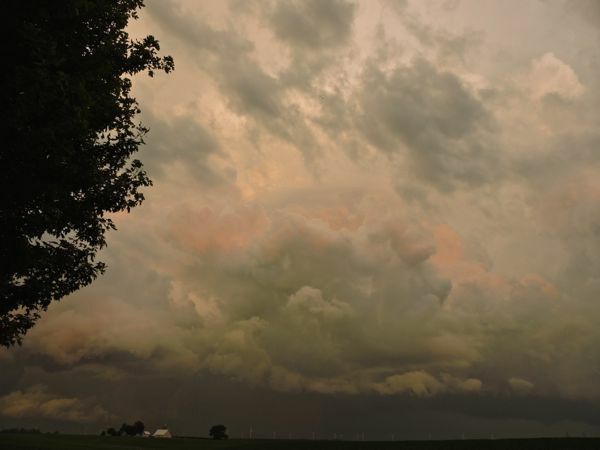 This is the same tornado-spawning cloud as in the earlier picture. 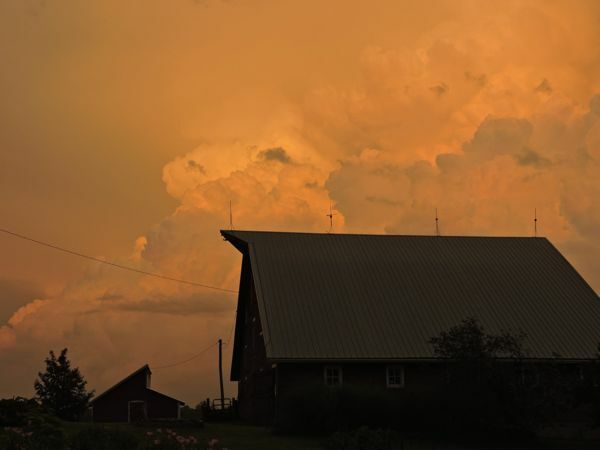 Clouds and the hog barn. This cloud made tornadoes by Tama. 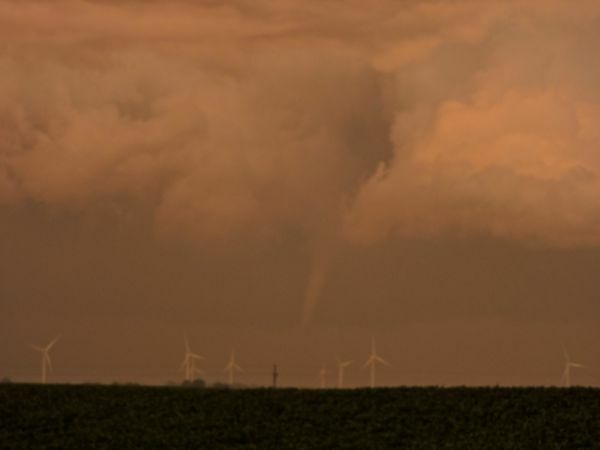 A view of the tornado near rock creek park in Jasper county. No wind here, and only a sprinkle of rain. There’s only two sides of buildings that haven’t been painted since we moved in. 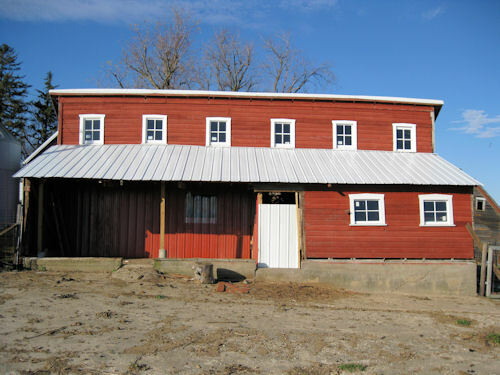 The north side of the old wooden machine shed, andt this, the east side of the hog barn. Since Claire is one to keep busy, I put her in charge of taking care of it (except for the high parts). Today marks a major milestone in hog barn renovation. 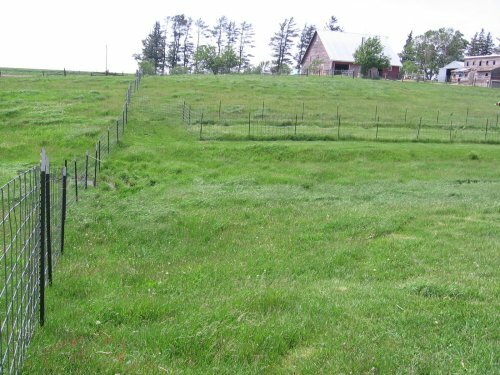 One of our stated farm goals is to “maintain the architectural heritage of the area.”Â To me, this means not automatically burning or tearing down old buildings and where possible to adapt them to creative re-use. 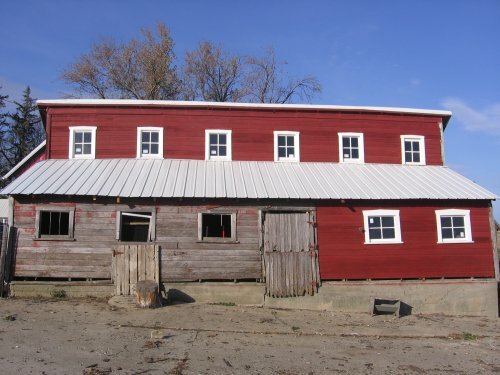 Here’s the hog barn at a place where it would have been torn down by many folks – no windows, major portions of the roof gone and what you can’t see from this photo – walls lilting at about a 15 degree angle. 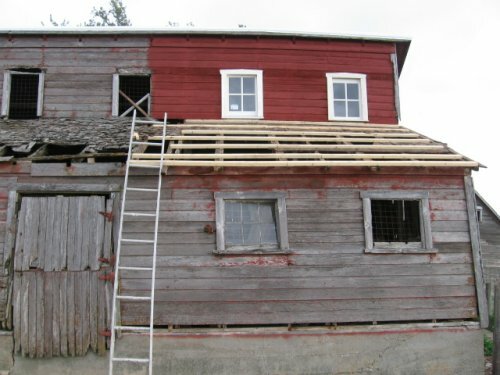 Here’s the same building with a new roof, new windows and a modification to allow for an animal “porch” so we have more options in separating out animals and having shelter from rain and wind – the new porch faces south. I still need to complete some trim, shore up parts of the building that were not rebuilt and where the white siding is, to put in a door. 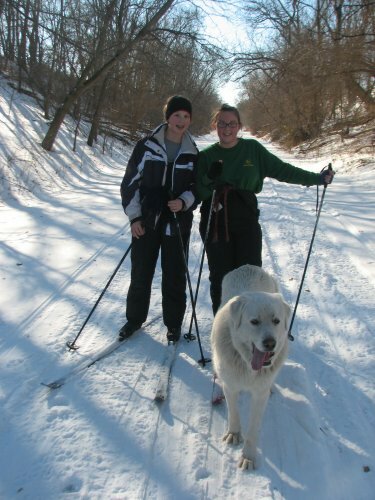 December 25, 2007 – Animals out on Christmas Day! 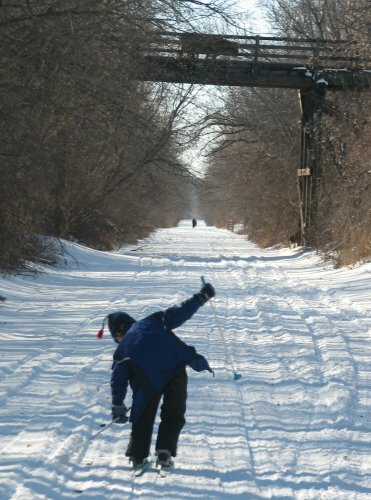 Before a hearty Christmas meal, we hit a trail to do some skiing. Here’s something you don’t see every day – Martin losing his balance upon seeing a cow crossing an old railroad trestle! In addition to the cows we saw earlier, this friendly white dog found the girls and accompanied them for the trip. The dog followed us all the way to the van and looked longingly at us as we drove away. At least he had some Christmas companions for part of the day! The girls and I went out for a moonlight walk across the fields. The fields are mostly all ice, with the recent snow all in drifts along fence rows and in our yard! 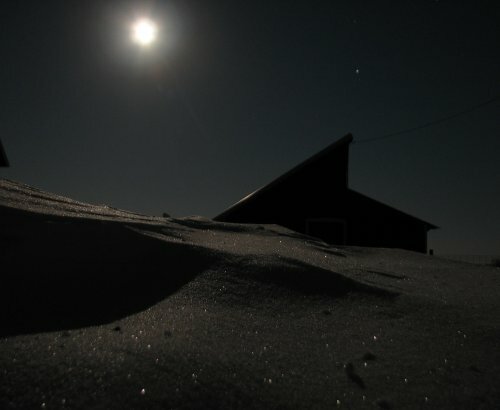 The night was calm and we trudged around for a mile or so to places we usually never go, and when I got back home, started playing around with the new camera – here’s a shot of a snowdrift in front of the hog barn. Another milestone on the hog barn project. Here it is as of this week – windows and roof all tucked in for the winter. The unpainted part will be ripped out and replaced later. Here it is October 3 of this year. I put this in mainly for myself because it seems I never get anything done, since I rarely have more than a couple hours at a time to work on a project, the progress seems painfully slow, but compared to what it used to be, even I can see improvement! 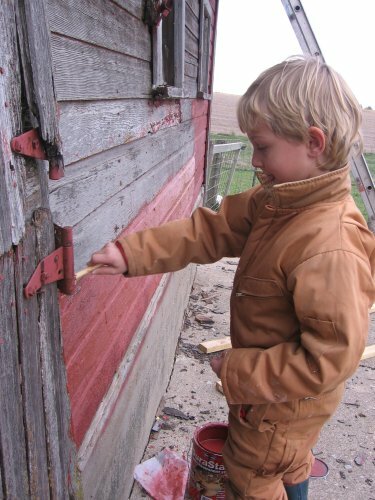 November 4, 2007 – More Child Labor! Today’s child labor was much more excited to work. A paint brush in the hands of a six-year old is a treat for this particular boy. Although the brush he was provided was small, he persisted for a long time, painting the bottom few rows of boards. He and Emma got the remaining unpainted lower portion of the hog barn completed. Now that the roof is done, “all” that remains is to tear out half the south wall and rebuild it inside for the “porch” and put in the new windows and doors. November 3, 2007 – Child Labor! Today was another milestone on the hog barn project. The roof was finished today! 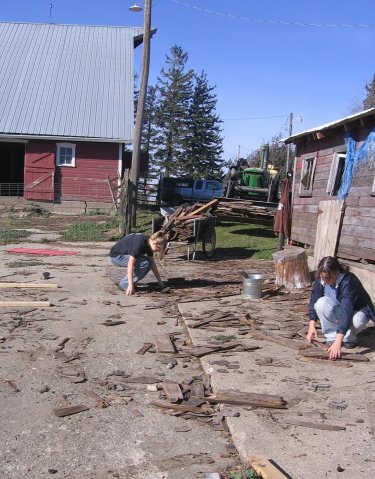 But, oh, the agony, asÂ the girls complained when they were “invited” toÂ help by cleaning up the waste from torn-offÂ roof from the ground and sort the asphalt shingles into the trailer for the landfill and wood into the loader bucket for the burn pile. But to their credit, they did. Another current project is the hog barn renovation. About 2/3 of the roof is now up. I’d like to finish painting the upper floor and get the remainingÂ 2nd level windows in and roof on this week. Following that, but not as urgently, is to paint the right hand side of the lower level and replace those two windows. The left side will be reconfigured to be a “porch” of sorts. The outer wall will be torn out and a new wall built what is now “inside” so animals will be able to get out of the sun and under the porch on this southern exposure from the outside. That way if the barn door should get shut by the wind during the day, the animals will have a place to go for shelter. Today was a hard day of labor on the hog barn. I ended up having to tear out the old roof as I went along as I wanted to get a direct connection to the new rafters to the 2×4 stringers across the roof. 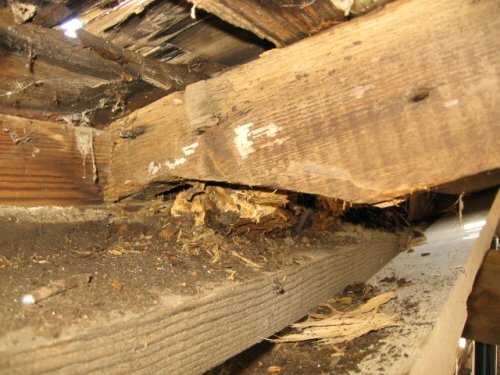 The old sheathing was really rotten. So, 7/18 of the length of the roof (not that I’m counting!) has the stringers across (on the newly attached rafters), ready for steel roofing when it arrives, probably some time this week. I also got some painting done and two new widows and trim in – the windows are a pain as there is lots to do. I decided to use the vinyl windows and trim, so it will never need to be painted. It was a good day’s work – dusty and hot as we are in the midst of a rare hot humid spell, with dew points reminiscent of summertime and the cement and brick floors of the outbuildings sweating with condensation. This is really dusty and dirty work as some of the dust in the roof has been trapped for 90 years! On the house front, I’ve finally found a drywaller to do the ceiling in the attic (way to many angles with the slanted roof and three cathedral ceilings in the dormers all coming together in odd angles). If I think of it, I’ll shoot an update of the progress up there this week. The first stage of putting a new roof on the hog barn begins. About 30% of the roof is gone, most of the rafters are rotted, but it is still standing. The first step is to replace the top plate of the walls and then add new rafters. Here’s a view of where the rafter meets the top plate on an exterior wall. The bottom 2×4 in this section was not rotten, but I cut and scraped out the top one. My friend is the Sawz-All today! A nice new top plate of treated lumber in place. Today I did this for about 40% of the length I need to do and notched and installed the new rafters along the same distance. 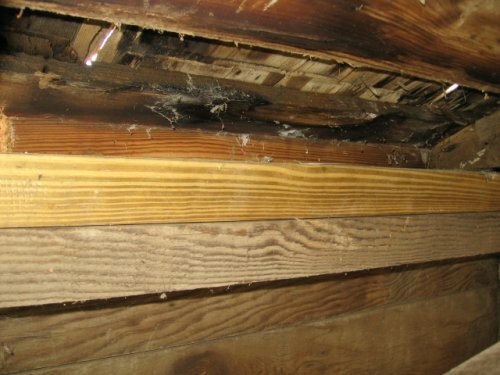 The same story over and over, get the floor jack out, lift up the old rafter about 3 inches, shove the new raftter in place, lower the old rafter and nail everything together. Repeat. Here’s what the current state is of the south side of the old hog barn. 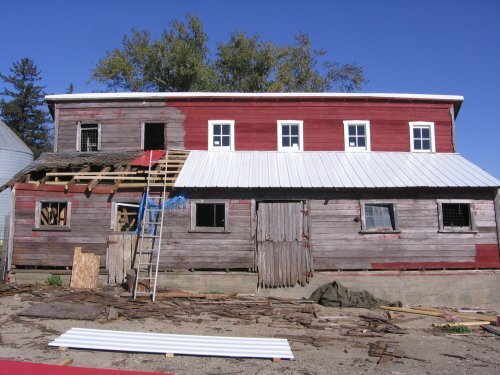 We’ve been fixing up buildings one at a time and it is now time to do this side of the old hog barn. We roofed and painted the north side two years ago, and it looks sharp (and dry). But you can see this side needs some work. Hopefully this will be a great “before” shot to compare to the finished product. The good part about projects likeÂ this one is that it’s easy and rewarding to make huge improvements even if things aren’t exactly perfect. Just having a roof and windows will be a huge improvement. Every time I drive home in the daylight, I can see this side of the building from the road and it bothers me. But from the driveway you see the good side and forget about it. 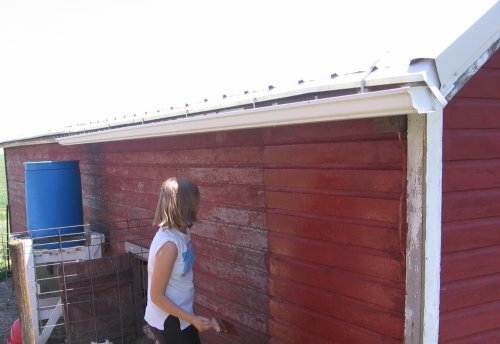 Emma finished scraping the north side of the old hog barn and started staining today. She used up all the stain and has it about 3/4 complete. She’s having fun doing something new and listening to her music outside while she stains. On Monday, it was a bit of rare day that all of us were home! We set everyone out with a job. It’s Emma’s summer to learn to paint. 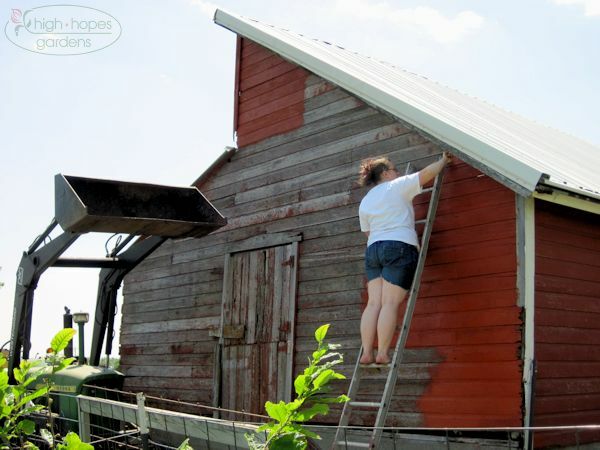 She wants to paint a side of the barn, so we are starting her out on an easier painting task, the north side of the hog barn, which doesn’t require much ladder work. Here, she is scraping off some of the old paint. There’s really not much left and we sprayed it with water first to keep down the dust. Claire is assuming more of the mowing duties on the farm. 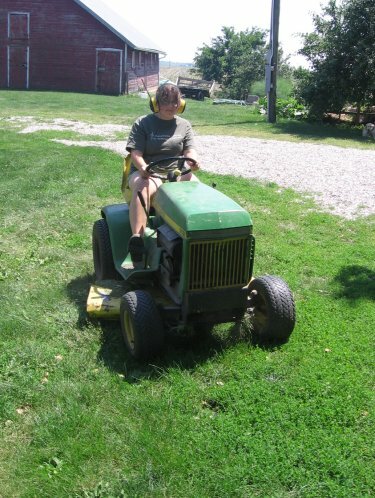 While the regular mower is in for repair, she gets to use the old lawn tractor. 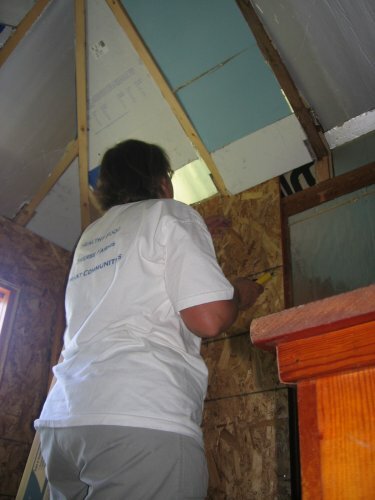 Linda gives me a boost in the attic, completing some of the insulation in the east dormer. 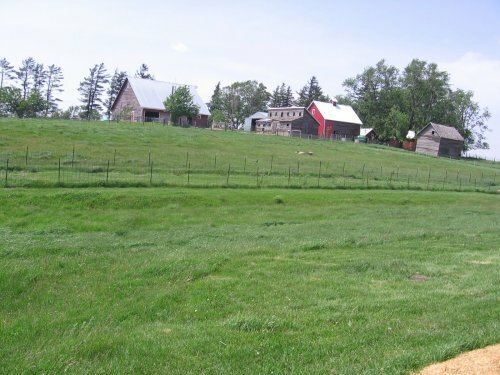 Today is the second in a series of views of the farm. I went to each corner of the property (and the midpoints) and took photos in different directions. The following views are from the SE corner of the property. This is from the SE corner shooting diagonally towards the NW. You’ll notice the corn crib is reroofed and all but about 80% of one side resided – that’s a fall/early winter project. 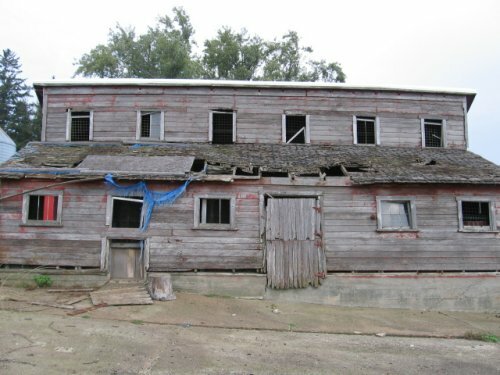 The project that is next outbuilding-wise is the renovation of the south side of the hog barn – the north side is tight and re-roofed, but the south is falling apart. Right now my time is devoted to the house, so it will sit a bit longer. This is the view looking due west from the SE corner. Just over the rise is a small orchard, trellised berries and a garden. Finally, this is theÂ view due north from the SE corner. 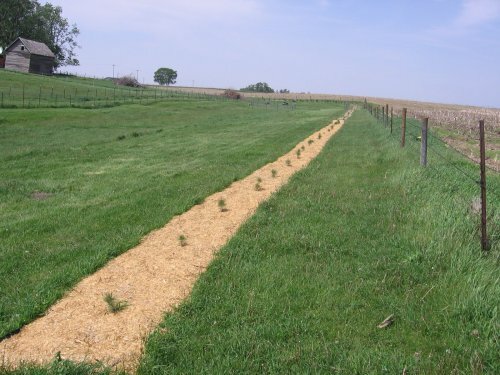 It shows the first row of trees along this boundary. Here’s a steely cold sunrise! 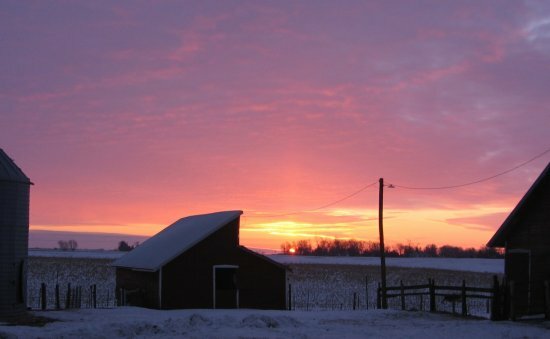 If nothing else, there’s a nice view on the way to do morning chores.